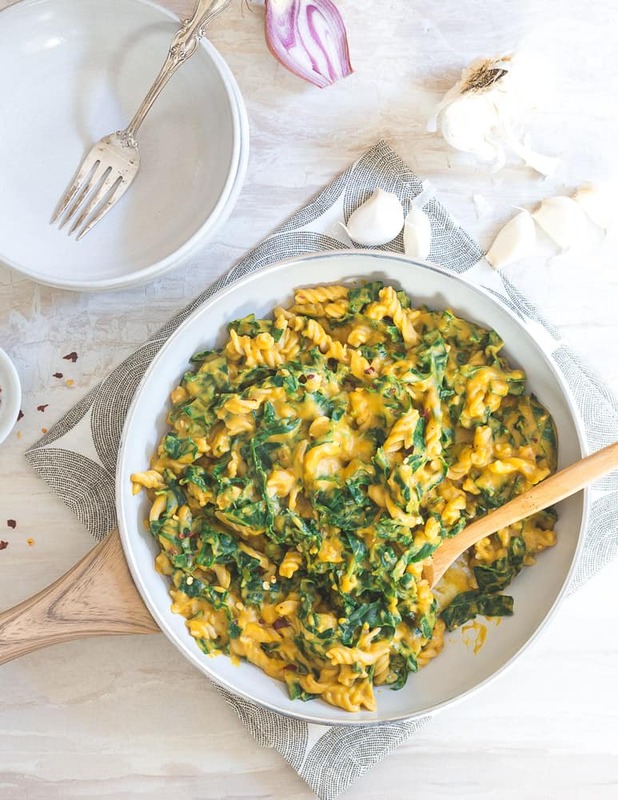 This pumpkin garlic pasta will satisfy all your savory fall cravings with it’s creamy texture and hint of seasonal spices. *This post is sponsored by Explore Cuisine. Now that we’re into November, I finally feel truly ready to embrace the warmth and coziness of late fall/winter meals. It feels like most of the internet is ready for this come September 1st (or sooner – you can imagine my major eye roll here) while I’m still living up any and all sunny, warm weather we get during that time knowing the winter will be long. But, come November, I give succumb to the inevitable. Trees turn into brown sticks, days are short and my favorite 2 pairs of oversized sweatpants have come out of their summer hibernation spot in my closet and will pretty much never leave the lower half of my body until April. This is the time I’m ok with pushing a creamy, decadent fall inspired meal like this pumpkin garlic pasta on you. Not in mid August, not even in late September but now, in the beginning of November with the start of the holiday season right around the corner. I teamed up with Explore Cuisine using their organic brown rice fusilli for this pumpkin garlic pasta. 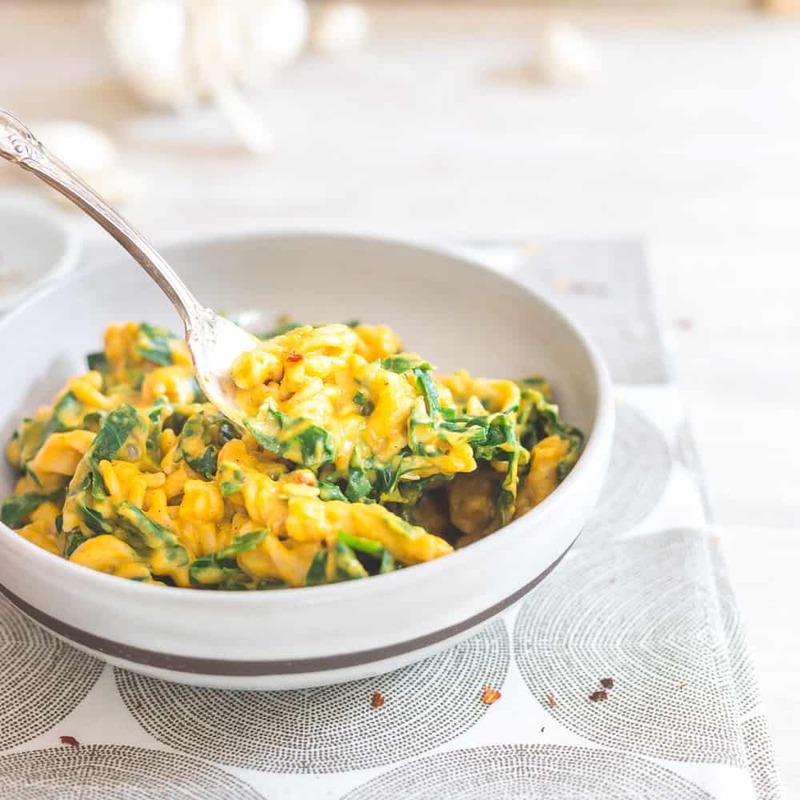 I’ve been a long time fan of gluten-free pasta options, rice pasta actually being a favorite because of that slight bit of extra chewiness it has – something I love! Explore Cuisine’s products are all organic, non-GMO, vegan and gluten-free. The brown rice fusilli is also boosted with pea protein making it a great source of both healthy carbohydrates and protein for your meal. When the ingredient list is all of two things: organic Thai brown rice and organic pea protein, that’s a complete win in my book too. 2% of all Explore Cuisine proceeds go to fund the Food To Thrive Foundation – a foundation dedicated to helping farmers succeed and flourish in and around the workplace providing education, empowerment and advancement in farming programs. This time of year, with the emphasis on “giving back” top of most our minds, it’s an honor to partner with brands who embrace that ideology through action. For me, the upcoming holiday season means a combination of doing my best to help out others in need and quality family time (usually centered around food if we’re being honest). Whether that’s a large fancy holiday meal or a simple, cozy, homemade, quick dinner like this pumpkin garlic pasta shared with my husband on the couch, both make me equally as happy. And when that cozy, simple dinner can all be made in the time it takes to cook the pasta, it’s hard not to be happy! 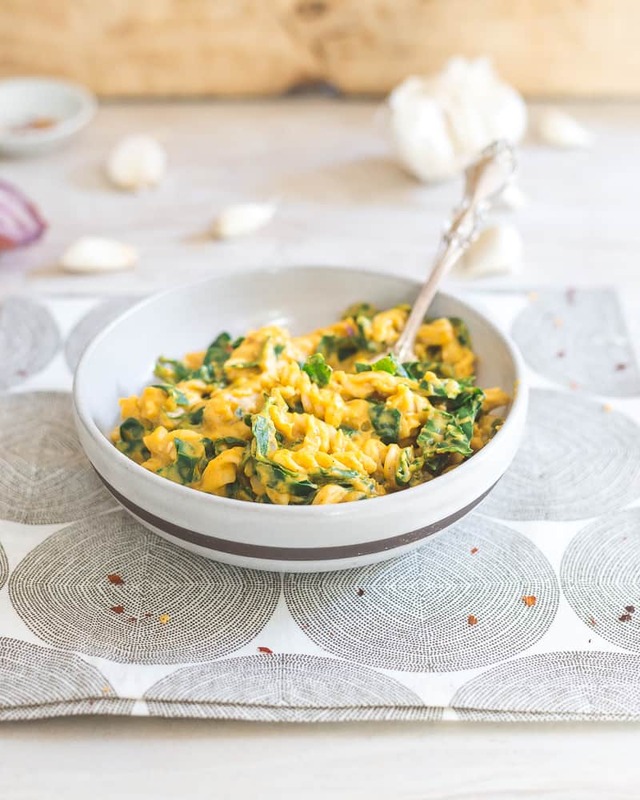 Love this creamy pumpkin garlic pasta with tuscan kale recipe? Check out these other cozy pumpkin recipes perfect for this time of year –> sweet pumpkin ravioli, creamy pumpkin barley with sausage, pumpkin hazelnut hot chocolate. 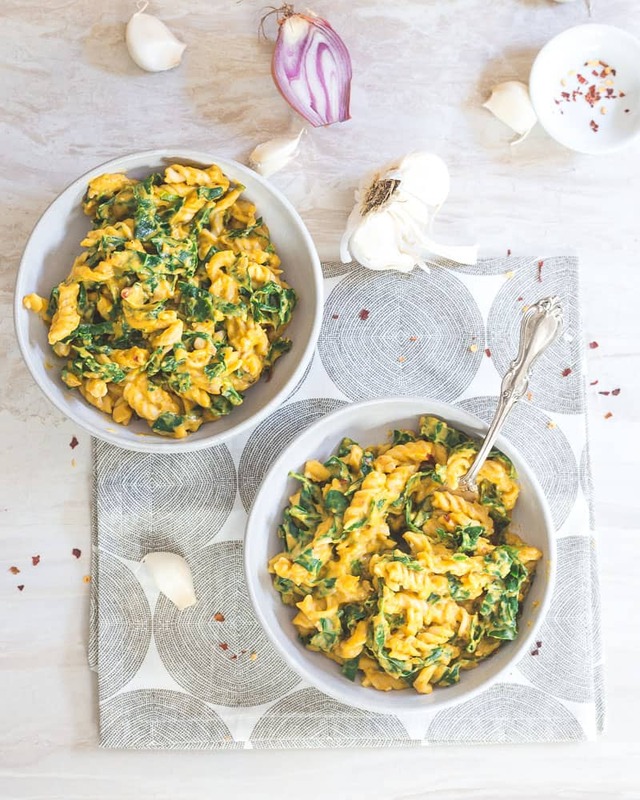 This pumpkin garlic pasta will satisfy all your savory fall cravings with it's creamy texture and hint of seasonal spices. Bring a large pot of salted water to a boil and cook fusilli until 1 minute before al dente according to package instructions. Add kale to the pot with the pasta with 1 minute cooking time remaining. Drain pasta and kale reserving 1 cup of the cooking liquid. While pasta cooks, add olive oil to a large skillet over medium heat. Once hot, add the shallots and cook for 1-2 minutes until softened. Add the garlic and red pepper if using and cook an additional 30 seconds until fragrant. Sprinkle the cornstarch (or arrowroot) on top, stir until combined then slowly add the almond milk to the pan. Whisk until smooth and the mixture starts to thicken, about 2 minutes. Add the pumpkin, salt, pepper and spices to the pan and stir until combined. Turn off the heat and add the drained pasta and kale to the pan. Add as much reserved pasta cooking liquid to the pan if needed for the desired sauce consistency (I used about 1/3 cup). -Feel free to use your favorite pasta shape and any milk you have on hand. To keep the recipe vegan, obviously choose a non-dairy milk option. This is TOTALLY my kind of pasta! Cannot wait to try this for dinner this week! This is total comfort. What a beautiful dish! This looks perfect for right now! And I absolutely love brown rice pasta; it’s my fave! 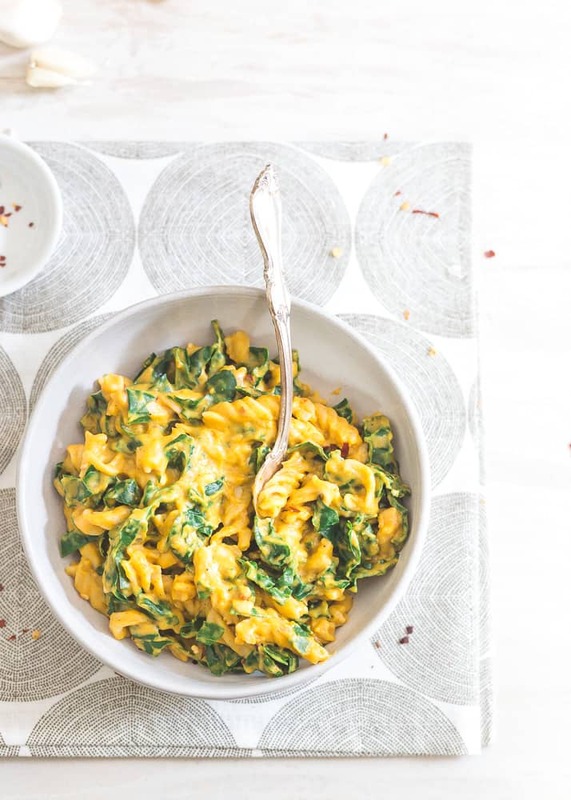 I haven’t tried brown rice pasta, but I love adding kale to pasta dishes, so this is getting added to my lunch plans! I’d love to tuck into a bowl of this while hibernating on the couch watching movies – hurray for cozy food weather! Oh my goodness this looks SO delicious! I can’t wait to try it!